Because we have the ability to carve our own necks, fingerboards and tail-pieces we are able to offer some options in the woods we use. We generally recommend that the neck proper (not including the fingerboard) be mahogany, a light but strong wood. When it comes to the fingerboard and tail-piece, however, there are some very attractive alternatives to the traditional ebony (the fingerboard on the neck to the left is ebony). You might be surprised to know that many traditional violins are made with fingerboards and tailpieces that are not specifically ebony. True ebony has become very expensive and is becoming increasingly difficult to find with suitable grain structure. Many various species of woods are used by contemporary makers. Fingerboards and tailpieces are often treated with a black pigment to reproduce the look of ebony, There is nothing technically wrong in doing so, so long as a suitable species of wood has been selected. 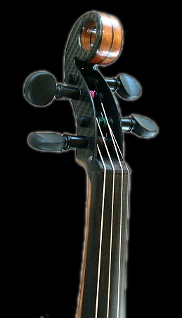 Virtually all makers use commercially available rough-carved fingerboards and tailpieces that are represented as being some species of ebony. We do the same if you specify ebony for a 4 string instrument. We can finish these pieces naturally (clear) -- which typically shows some wood grain under strong light and close inspection -- or we can dye the wood black prior to finishing. Traditional makers use ebony or ebony substitutes because that's what many people expect to see on a violin. Our violins, however, are black, so using a contrasting wood with some color can be very appealing. Our wooden sections are surface permeated and top-coated with a specialized marine-grade epoxy resin. This resin is virtually impervious to water vapor (unlike all paints, varnished, lacquers, etc. ), rendering our necks relatively immune to damaging variations in humidity, as well as being water proof. Because we have seen warped fingerboards in traditional instruments we do the same for ebony/ebony alternatives when it's the wood specified. We do not stock all woods at all times. We hand select from the various species, and sometimes there simply isn't a suitable section of wood available. Additionally, we sometimes come across something particularly special in a wood that is more typically not visually interesting, and is therefore in limited supply. The photos below represent the color of the woods as best we can, but you should remember that not all screens on the various devices in use are identical in how they reproduce color. It's also possible to change the settings on most displays, including adjustments that impact color. Also, because wood is a naturally grown material, the grain pattern will vary from what is shown below. All woods will darken with exposure to sunlight over time. The top-coat we use is a special epoxy blend that includes UV inhibitors to minimize this effect, but it will happen. Although we are advocates of keeping instruments out of their cases to invite playing them, you can help preserve the color of the wood you select by keeping it out of direct sunlight. These photos are well lighted to make the grain pattern clear. All of these samples will appear darker in evening room light. Wenge is a dense wood with long, closely packed grain. It is what we often use as an ebony alternative. Although shown here when well lighted, in normal lighting and from a distance it is quite dark to black. This species is popular with our customers. It contrasts nicely with the black carbon fiber body. It is dense, fine-grained and works very well for violins. It's difficult to capture lacewood in a picture. The fine, lace-like grain tends to iridesce as a response to the movement of light. This lovely, golden-hued hardwood displays distinct striping in its grain pattern. Suitable sections of this wood are not always available. Padauk is a colorful wood with distinctive grain. There is generally considerable color variation within the grain (as can be seen in this sample).